Loyola University Chicago’s independent music radio station, 88.7 WLUW Chicago, provides listeners with an eclectic mix of just about anything they could want from radio. As both student and community based, WLUW has been thriving since the 1970s. After winning two 2012 Silver Dome Awards from the Illinois Broadcasters Association in September, WLUW proves its relevance and excellence in local radio. Click through this slideshow to get behind-the-scenes look at the station and put faces to those radio voices. 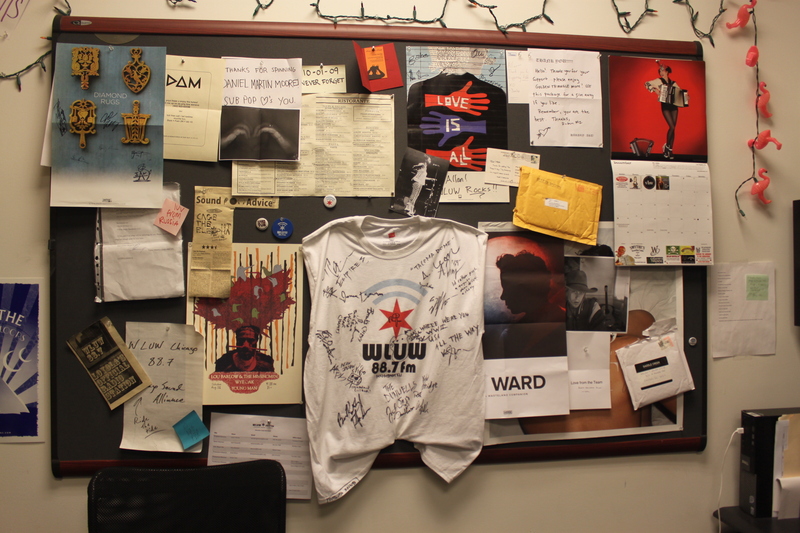 Music posters, buttons and memorabilia grace the WLUW office bulletin board. The T-shirt holds signatures of the artists that stopped by the Toyota Free Yr Radio tent at Lollapalooza 2012, where WLUW broadcasted live. All photos by Gillian McGhee.